This topic provides step-by-step instructions for installing and configuring DataKeeper Cluster Edition. The series of steps includes links into the documentation that describe each step in detail. Read the DataKeeper Cluster Edition Release Notes for late breaking information. Configure your Cluster – It is important to have Windows Server configured as a cluster using either a node majority quorum (if there is an odd number of nodes) or a node and file share majority quorum (if there is an even number of nodes). Consult the Microsoft documentation on clustering or this article on the Clustering for Mere Mortals blog for step-by-step instructions. Microsoft released a hotfix that allows disabling of a node’s vote which may help achieve a higher level of availability in certain multi-site cluster configurations. This hotfix and when it should be used is described in this article in Clustering for Mere Mortals. Note – If installing DataKeeper Cluster Edition on Windows “Core” (GUI-less Windows), make sure to read this section for detailed instructions – Installing and Using DataKeeper on Windows 2008R2 Server Core Platforms. The following sections describe the most common cluster configurations. Follow the instructions in the section that most likely matches your environment. The initial configuration must be done from the DataKeeper UI running on one of the cluster nodes. If it is not possible to run the DataKeeper UI on a cluster node, such as when running DataKeeper on a Windows Core only server, install the DataKeeper UI on any computer running Windows XP or higher and follow the instruction in the Core Only section for creating a mirror and registering the cluster resources via the CLI. Note – If clustering Hyper-V VMs, do not add the DataKeeper Volume Resource to Available Storage at the end of the mirror creation process. Instead, allow the mirror to create but do not choose to register the DataKeeper Volume in Available Storage at the end of the Mirror Creation Wizard, then follow the instructions on this page, Using DataKeeper Cluster Edition to Enable Multi-Site Hyper-V Clusters. Make sure that Virtual Network Names for NIC connections are identical on all cluster nodes. With the DataKeeper Volume(s) now in Available Storage, you are able to create cluster resources (SQL, File Server, etc.) in the same way as if there were a shared disk resource in the cluster. Refer to Microsoft documentation for additional information or view this article in Clustering for Mere Mortals for step-by-step cluster configuration instructions. Once the DataKeeper UI is running, connect to each of the nodes in the cluster. Important – In order for DataKeeper to detect that a disk is shared, ALL of the nodes of the cluster must be connected to through the DataKeeper UI. Prior to creating the DataKeeper Job, the storage must be configured such that the nodes located in the same location each have have access to the shared storage. 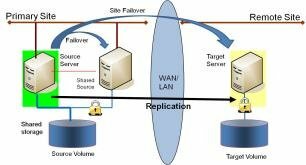 The instructions for the Safe Creation of a Shared-Storage Volume contain the information needed to safely give both servers access to shared storage once the storage has been provisioned and the same LUN has been handed off to each of the shared cluster nodes. The process of provisioning the storage and handing it off to two or more servers at the same time will be dependent upon the storage array. Please refer to your storage documentation for instructions on provisioning storage for clustered environments. 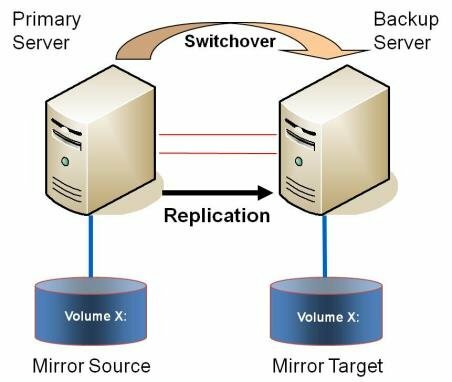 Create a job using the instructions in “Creating Mirrors With Shared Volumes.” This process creates a mirror as well as collects information about the shared disks and then adds the DataKeeper Volume resource to the Available Storage. For more information, please refer to the DataKeeper Cluster Edition Technical Documentation.